The Legislature blazed through its annual joint session to confirm or reject appointments made by Gov. Bill Walker, finishing the session in a little over an hour. Out of 99 appointments, the Legislature confirmed all but one of the appointees. That’s because Linden once worked for Planned Parenthood’s political wing as a field organizer, but you wouldn’t know it by the skimpy debate that preceded the vote. “I just looked at the background and listened to the hearing, and I just don’t think it’s a good fit for the board,” she said, without adding any elaboration. Sen. Berta Gardner, D-Anchorage, spoke in favor of Linden’s appointment, noting that Linden was recommended by the midwife who helped her with a home birth. “She supports safe, compassionate care,” Gardner said. Linden’s appointment was rejected on a 32N-28Y vote. Though conservative opposition to Planned Parenthood didn’t surface during the confirmation vote, it did arise during committee hearings. During one hearing, Rep. Colleen Sullivan-Leonard pointed out Linden’s connection with Planned Parenthood and suggested her “organizing tactics” in support of an organization that provides abortion services were incompatible with the job of a midwife. Linden ran for the Palmer City Council last fall with term limits as one of her key priorities, but came up short in a multi-way race. Her work with Planned Parenthood also featured strongly in a whisper campaign against Linden. Votes against: Sens. Bishop, Coghill, Costello, Giessel, Hughes, MacKinnon, Meyer, Micciche, Olson, Shower, von Imhof, Wilson and Kelly. Reps. Birch, Chenault, Eastman, Grenn, Johnson, Knopp, Kopp, LeDoux, Millett, Neuman, Pruitt, Rauscher, Reinbold, Saddler, Sullivan-Leonard, Talerico, Thompson, Tilton and Wilson. All legislators were present for the day’s confirmation hearings. Any legislator not listed in the votes against below voted in favor of the appointment. Walker ultimately shied away from controversial appointees to the Board of Fisheries, but did run into objections to both of his appointments to the Board of Game. 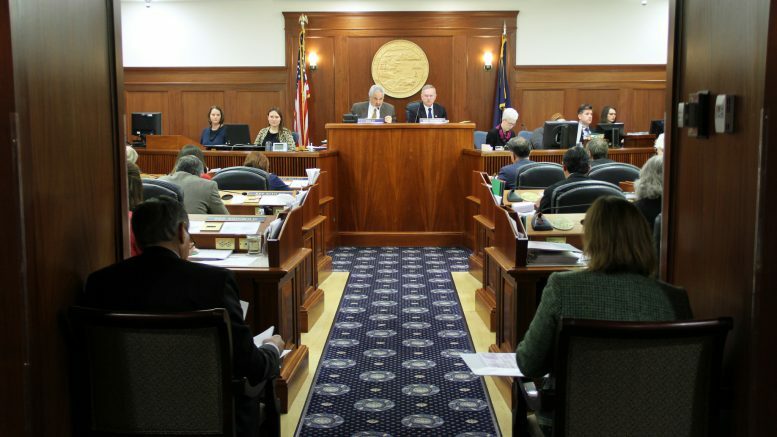 Teresa Sager-Albaugh, of Tok, faced opposition by legislators who said she’s a frequent opponent to anything related to Alaska Native subsistence rights. There was no voiced objection to Lawrence Van Daele, of Kodiak, but Kodiak-area legislators spoke glowingly of his appointment. Sager-Albaugh was confirmed on a 44-16 vote. Votes against: Sens. Wielechowski, Gardner, Hoffman and Olson. Reps. Drummond, Gara, Guttenberg, Josephson, Kito, Kreiss-Tomkins, Lincoln, Spohnholz, Tarr and Zulkosky. Van Daele was confirmed on a 50-10 vote. Votes against: Sens. Wilson, Hughes and Shower. Reps. Eastman, Johnson, Neuman, Rauscher, Talerico, Tilton and Wilson. The Legislature was also asked to confirm Public Defender Quinlan Steiner for his fourth term as the head of the state’s Public Defender Agency (he was first appointed in 2005). He was confirmed on a 58-2 vote with Rep. Lora Reinbold waging the main opposition to Steiner, who she accused of having a hand in the spike in crime rates. Steiner, who obviously ended up having broad support of the Legislature, got perhaps the most ringing endorsement from Rep. Tammie Wilson, R-North Pole. She argued that public defenders have it tough with the cuts and respected the job Steiner has done. Department of Health and Social Services Commissioner Valerie Davidson was confirmed as the successor to the lieutenant governor in case he can no longer fulfill his job. The confirmation vote was on a 47-13 vote, and the objection to her appointment was brought by Rep. David Eastman, R-Wasilla. Votes against: Sens. Hughes, Shower, WIlson and von Imhof. Reps. Eastman, Johnson, Neuman, Rauscher, Reinbold, Sullivan-Leonard, Thompson, Tilton and Wilson. Ridle for Administration 59-1. Votes against: Rep. Kito. Navarre for Commerce 49-11. Navarre took some flak for his recent hearing on linking revenues to economic development. Votes against: Sens. Hughes, Shower and Wilson. Reps. Eastman, Neuman, Rauscher, Reinbold, Sullivan-Leonard, Talerico, Tilton and Wilson. Fisher for Revenue 50-10. Fisher saw opposition in the form of a lengthy rebuttal by Sen. Bill Wielechowski, D-Anchorage, who said Fisher has pursued policies that favor the wealthy. Votes against: Sens. Wielechowski and Gardner. Reps. Eastman, Gara, Guttenberg, Kito, Parish, Rauscher, Tarr and Tuck. Vershawn Idom, Anchorage, confirmed 58-2. No debate. Votes against: Sen. Gardner. Rep. Eastman. Freddie Olin IV, Anchorage (an earlier version of this story had the wrong city), confirmed 58-2. No debate. Votes against: Reps. Eastman and Johnson. Stephen (Joey) Sweet, Anchorage, confirmed 59-1. No Debate. Votes against: Rep. Eastman. Taylor Winston confirmed on 58-2. Votes against: Reps. Eastman and Reinbold. Be the first to comment on "Legislators reject just one of Gov. Bill Walker’s appointees, but refuse to say why"